We’re continuing our discussion with Luke Broadwater. He is the City Hall reporter for The Baltimore Sun. Thank you so much for joining again, Luke. LUKE BROADWATER, CITY HALL REPORTER, THE BALTIMORE SUN: Thank you. NOOR: So, Luke, in our first segment we were talking about some of the ways the city is spending its tremendous resources and money, including, like, developments like Harbor Point. One thing that people are concerned about or maybe want to see more investment in is the water system. And Baltimore has a very old water system. And every winter, including this winter, there’s water main breaks all over the city. And that’s something that you’ve been reporting on extensively. So talk about what–the problems the city is facing and why the city’s water main system is in such bad shape today. BROADWATER: Sure. I think on an average day in Baltimore there are about three water main breaks, which is a result of just really aging and old infrastructure. What we’ve seen over the last two weeks is a tremendous spike in that. We’re seeing about seven times what’s normal. The city blames that on the really brutal cold we’ve had. We’ve had, starting about two weeks ago, about Presidents’ Day, we’ve had sub-zero temperatures for many days in a row. And what that’s done is not only break pipes, but it’s frozen a lot of water meters as well. The water meters, the city says, are designed to be the weakest link in the water system, and they are freezing and busting all over the place. Just this month we’ve had 8,000 customers report–8,000 customers report that they either have leaks or no water. The city says they’ve made a lot of progress in cutting down on that, especially over the last week. The mayor has done a bunch of things. She’s ramped up the number of people who are working on it. They’re giving out overtime. They’re making people work longer hours, work 24-hour shifts, or they’re staffing a call center 24 hours a day now. People are working 12-hour shifts. But as of this moment, as we talk right now, there’s still 2,100 some people who don’t have water. We did a story this week. I interviewed a couple in Charles Village. Actually, they run a townhouse up there. There’s three apartments, and so there are six people total. And they were out without water for 12 days. And what that means is if you’ve got family in the area, great. You can go stay with your mom or something and take a shower there. But if you don’t, you’re really cut out of luck. These were people–the girl I talked to in the story had moved from Arizona. She doesn’t have family in the area. And so what they did is they kind of relied on the kindness of acquaintances and strangers. They filled up their–they walked down the street to get water jugs from a nearby cafe to feed their pets. Some of the people the building were taking snow and packing it into the toilets so they could flush the toilet. It’s really something, like, out of a non-modern country to be without running water for almost 2 weeks. So I think it’s a very widespread problem, and it’s still a problem as we speak right now. NOOR: And so people that have heard the first segment and are now watching this would say, you know, so the city has given something like $400 million in tax breaks and other incentives to developers while basic infrastructure is clearly in such bad need. BROADWATER: Yeah, the infrastructure problem is a real problem. NOOR: And it’s not just the water main breaks. Like, last year we a whole street collapse a few miles from here. BROADWATER: Yeah. I could not believe that when we saw that happen. I think it was Charles Street, 28th Street. I mean, half the road fell off into the train area there. Cars were falling off. It was amazing. And that was just ’cause it rained a lot. You know. So when it rains a lot or gets really cold, our city’s sort of crumbling. And again, we bring these issues all the time to City Hall, and the mayor always says past administrations basically didn’t keep up with the infrastructure. You had a lot of money being spent elsewhere, and they weren’t focused on the pipes. They say they’re doing a lot of work on the pipes all the time. They’re trying to keep up with it. But it’s such a massive job that it can’t be fixed in a week or a month, or even a year. They need constantly to be redoing the pipes. NOOR: And certainly investing in something like that is not as glamorous and ritzy as doing big developments down by the harbor. BROADWATER: No. And I think infrastructure’s a problem all over the country. I think you’re seeing a lot of roads and bridges all over the country that have been allowed to deteriorate without the proper funding and maintenance. And we’re seeing that especially in our older cities. 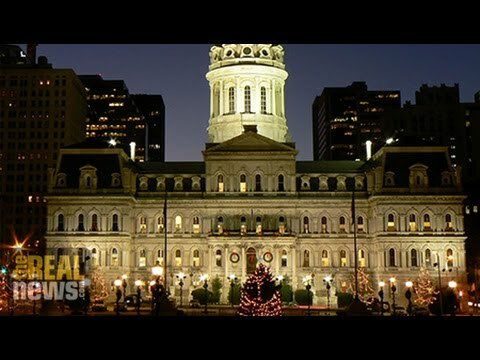 Baltimore’s one of the oldest cities in the country. So it’s like Ground Zero for this kind of stuff. NOOR: So another story you’ve worked on is around compensation claims for police officers that are involved in fatal shootings, or even nonfatal shootings. And in Baltimore we’ve seen waves of protest. Some have described them as historic. There’s new bills proposed in the City Council and in Annapolis to kind of deal with this issue of police violence and killings. And an issue people raise is the fact that police officers, after they’ve killed someone, can get workers compensation claims while themselves are almost never held accountable for those incidents. BROADWATER: Yeah. That’s something I discovered. Every year I tried to do an investigation or a project in addition to my daily beat reporting assignments. So, like, every day I usually write something. I go someplace, I check out something, and I write about it. But in addition to that, I try to always be working on a project. And two years ago–maybe it was last year–I looked into workers’ compensation. And so I filed a bunch of public information act requests. I wanted to see where the money was going. I always try to follow the money. And one thing I noticed was I saw a bunch of instances where after fatal shootings, police officers were being paid usually somewhere around $30,000 through workers’ compensation claims. And that struck me as interesting. It was surprising to me. I didn’t realize that that was even a possibility. As I looked into it more, I found out there’s a real debate over this. On the one side, you have police officers who do say and do report going through real mental anguish after they kill someone. They say no one wants to go out and kill someone. It’s not necessarily what they signed up for the job for, and they have a real hard time dealing with it. And so, through the workers’ compensation system, you can get paid for psychological stress. On the other hand, you have people who are family members of the deceased who feel like that is incredibly unfair. They feel like their lives are ruined. They feel the stress. And they can’t get these same types of workers compensation payments, or even payments at all, sometimes, from their loss. So you have a sense of unfairness on the one side, and then you have what I do believe is a legitimate problem on the other. And I think it all–all these problems that we talk about stem from, I guess, sort of a dysfunction in society, right, a dysfunction in that we have every year police officers shooting and killing people on the streets Baltimore. And that’s a problem. And it’s a problem because we have high crime, it’s a problem because we have high murders, it’s a problem because we have a problematic drug trade and we have a police force that’s armed and trying to combat this. And you see a lot of people resulting in–situations resulting in death. And it’s hard to grow and build and attract people to a city when you have that level of violence. NOOR: And you’ve seen the toll of that not only in the streets, but in the schools as well. And last year, a little more than a year ago, you did a story about how Baltimore spent almost $50 million on worker compensation claims. And one of the biggest recipients of those were public school teachers who had run-ins with students in the classrooms. BROADWATER: Right. Yeah. That was another thing that we noticed as we were going to the data. We said, wow, there’s a lot of teachers that are getting punched and assaulted and beaten in the classrooms. And so we spent a lot of time with–I worked on that story with Erica Green and Scott Calvert and just tracking down teachers, getting them to tell their stories and come forward with this information. I don’t think a lot of people when they sign up to be a teacher think that their health or safety might be in danger, but that unfortunately is the case, and it’s the case more than one might think. I mean, people think police officers, firefighters, okay, those are dangerous jobs, right? You know, you might–you’re going to be in some rough situations–fighting fires, dealing with criminals. But a teacher–I think a lot of people were surprised to see the level of violence and of claims that are filed by city school teachers. NOOR: And so it seems like–you know, or one could ask the question, what’s really being done to address some of these underlying causes that lead to so much violence and poverty and joblessness? Which all seem to be tied into each other, because when you look at the most violent neighborhoods, you’re talking about the neighborhoods with the highest unemployment rates and the highest rates of incarceration in the city. BROADWATER: Yeah. I think–I was talking with one expert in one of the stories I did about the police shootings, and he said–we were talking about why America stands out, why America’s so different, ’cause you look at England, the cops don’t shoot anybody in England. You look at Japan, the Japanese don’t shoot anybody in Japan. So why are we so different? And he posited–and I thought this made a lot of sense is you could–you can have poor countries in the world that don’t have the same level of violent problems, and you could have countries in the world with a lot of guns that don’t have these same level of problems, and you could have countries in the world that fight the drug war and you don’t have the same level problems. But if you have all three, if you have poverty, you have an incredible amount of guns, and you have the drug war, you have this recipe for just violent clashes all the time and a very violent culture. And I don’t know how you change that. Like, that is years in the making. That’s decades in the making. I think you can probably chip away at it gradually on all fronts. You can probably chip away at trying to raise incomes. You can chip away at the way that police attack the drug war. NOOR: Well, and also some would say that, you know, put people to work, like, have a jobs program for these neighborhoods where they’re not hiring. NOOR: And that doesn’t seem to be on the mayor’s agenda or the City Council’s agenda in the city. BROADWATER: Well, there’s–so poverty, if you put people in those jobs, that would take care of one-third of the problem. Right? It would take care of the poverty problem. I will say this. And many might argue that these efforts are not robust enough. But they do have an office in which they try to align residents with jobs. It’s called the mayor’s office of economic development or neighborhood development. And that whole office, their job is they have a guy named Jason Cohen, who just got hired to run it, and his job is to find businesses and say, what do you want out of employees? And then find people without jobs and say, what skills do you need to connect them and try to match these people up? So they do have an office that does that. Is it working? Is it doing enough? Those are all fair questions. NOOR: Alright. Luke Broadwater, thank you so much for joining us.